Meeting of the Agency of Strategic Initiatives Supervisory Board. 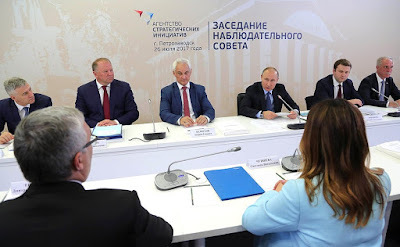 Putin.BLOG Civil Service Regions Meeting of the Agency of Strategic Initiatives Supervisory Board. Vladimir Putin chaired a meeting in Petrozavodsk of the Supervisory Board of the autonomous non-commercial organization Agency for Strategic Initiatives to Promote New Projects. The participants discussed the results of ASI’s work over the first half of 2017 and promising projects planned for implementation in 2017–2018. 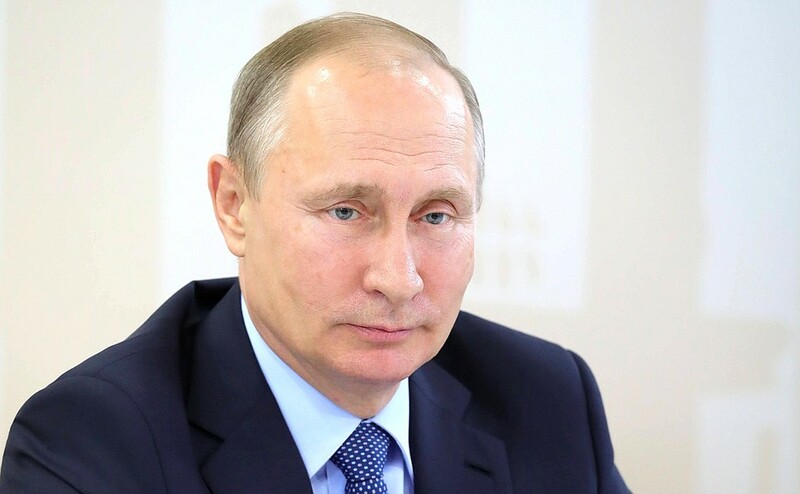 They include a package of measures to develop the volunteer movement in Russia’s regions, and plans for establishing a fund to support social projects. As you can see, we decided to hold this latest meeting of the Agency for Strategic Initiatives Supervisory Board here in the Republic of Karelia. In this context, I want to say that over the six years since it was established, ASI has become an effective partner for the regions in developing and implementing development strategy, and demand from the Russian regions for this kind of cooperation is growing all the time. As the Acting Head of Karelia told me, ASI was not present in the region before now, but right from the first steps, as the regional head sees it, in any case, it is clear that this is very interesting and promising cooperation, very useful, as he and I both hope. It is important that ASI’s new director has succeeded fully in continuing the commitment to the Agency’s aims and principles and the cooperation with the business and expert communities. I know that ASI is expanding its fields of activity and addressing ever more complex tasks. Many of its plans are related to regional agendas. I hope that you will continue to support the regions and help them to build modern management models, improve the business climate and propose examples of best practice in the social sector. The main task is to create the environment, possibilities and conditions for positive change in the regions, bring together those who are ready to design and implement development plans, and exchange experience. This includes young people, businesspeople, volunteers and innovators. The Boiling Point hubs that are already working in Moscow, St. Petersburg and Ivanovo serve as poles of attraction and discussion platforms, and one of these hubs is now opening here in Petrozavodsk, in Karelia. This gives the region and business new opportunities to find young, ambitious and promising personnel for work at various levels and in various areas. I note that all the necessary organizational work should be carried out swiftly. 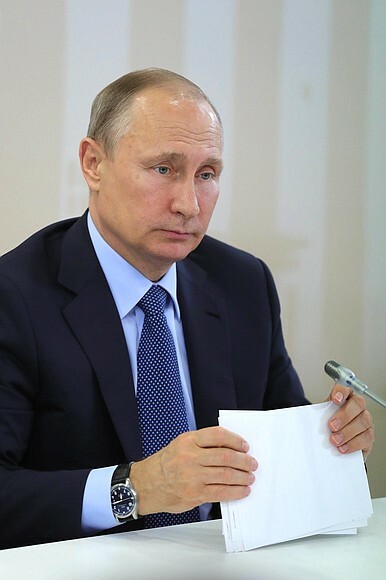 Acting Head of the Republic Artur Parfenchikov has sensed the subject’s importance and has taken personal interest and got fired with enthusiasm now. I want to thank you for supporting the Agency’s work and I hope that this cooperation will be useful for the region. I will spend a moment discussing a few specific areas, which, I believe, are critical. It is imperative to continue to work on creating a favorable business environment, which is what you have been doing for quite a while now. The National Investment Climate Rating of Russian Regions became a serious incentive for making changes in this area. Regions which have so far received relatively low ratings have become more active in their work with entrepreneurs. Competition between regions has increased. Since I keep in touch with the leaders of regions, I am aware that one may be tempted to chuckle and say that these innovations are far-fetched, and that real life is more diverse and complex than that. You can have a laugh, but it is clear to me that this activity is following the right path, and we need it. If we do not do this, things will gradually come to a standstill. I believe that the rating should be an integral part of the regional management teams’ performance evaluation system. I ask the Government to draft relevant amendments. I would also like to mention the effective work of the Leaders Club to remove local administrative barriers. I wish the club to continue to work as productively as it does now. Next, the ASI plays an important role in enhancing the prestige of the working professions. I consider this aspect of its work to be particularly important. The results of the championships among young professionals have become a benchmark for secondary vocational education institutions. I think you need to pay special attention to training engineers, especially in regional universities, which train specialists for specific enterprises. In this regard, take note of the opportunity that the law gave to higher education institutions several years ago. I am referring to creating small and medium-sized businesses at higher education institutions with access to equipment, facilities, and so on. Here, at this university, a senior official also showed me and, I think, quite convincingly spoke about the development of this type of activity in many different areas. Under the guidance of their mentors, the students achieve rather significant and interesting results. The social component is acquiring special importance on the ASI agenda. We have just met representatives of non-profit, charity organizations and volunteers. They are working in education and healthcare, helping children, the elderly and critically ill people. This is what I want to emphasize in this context. Regions should clearly understand their responsibility for creating a favorable, hospitable environment for the work of NGOs. I would like to ask the Agency to draft a standard of support for volunteers and non-profits in the Russian regions. I am referring to specific legal, financial and organizational tools, which, incidentally, we discussed today at the meeting with representatives of the non-profit sector. And one more point. We have a mechanism of grants for non-profit and public organizations. It is fairly efficient. We spoke about this today and I was pleased to hear that. In effect, it is aimed at supporting already functioning organizations. Today speakers at the meeting justifiably asked about the formation of a comprehensive system for the development of volunteer and non-profit organizations and social entrepreneurship so as to enable more enthusiasts to provide real help to society and people. I would like to hear your proposals on this issue at today’s meeting as well. Now I am giving the floor to ASI General Director Svetlana Chupsheva. Mr. President, thank you very much for your praise. I would like to thank all members of the Supervisory Board present here and those who were unable to attend, because this is indeed the result of our joint efforts, and everyone present here, including Mr. Gref [Sberbank CEO, Chairman of the Board], who was unable to attend – we work together on all projects, all initiatives. Essentially, we have a kind of a partnership platform and we implement special projects in education and the investment climate. Why was Mr. Gref unable to attend? He is so important. I'll hope he gets better soon. In fact, he supports a number of projects – education, skills of the future – on which we are working together. Of course, Mr. President, fostering entrepreneurship and leadership in various areas, in the economic field and the social field remains our priority. We do not ignore individual leadership projects. A total of 268 projects have been submitted so far this year. Each portfolio – Young Professionals and New Business – includes social projects. There are about 100 projects that we support on an individual, local basis. Vladimir Putin at the meeting of the Agency of Strategic Initiatives Supervisory Board. Regarding the investment climate, as you have noted, this year we presented national rating results to the St Petersburg forum and you also mentioned the achievements of our regions, which made it to the top 20, including Moscow, the Moscow Region and St Petersburg. Both Moscow and St. Petersburg are of course very important for us with regard to Russia’s position in the World Bank’s Doing Business ratings. At a meeting with volunteers, the best educational program – Uchi.ru – was presented: They have entered the BRICS market. 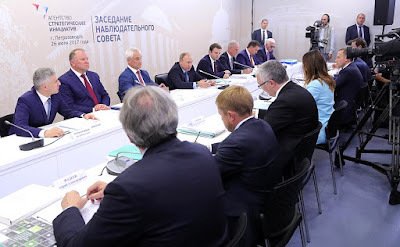 We have already received requests from several countries, our partners and friends, who would like to use our methods as a model, to know more about how this activity was organized here and how Russia managed to make such a breakthrough in various business services including construction, energy, taxation and export potential – and within such a short period. So we are also thinking about formalizing this as a standard that can be passed on. Recently we met with the Argentinean Ambassador, and Argentina also made a request for this practice to be laid out. They want to learn from us. We will be happy to share the programs that were designed through the Ministry of Economic Development and members of the Government, and which are being implemented currently in the regions as well as at the federal level, with our colleagues in India and several other countries. I believe we have something to share. Certainly, our work with the regions has been taken to new heights and it is clear that we can be of help there. The confidence the regional heads place in us is very important. Indeed, several initiatives are already being implemented locally. Upon your instructions, we have created a development strategy for the Novgorod Region – along with the local government. Mr. President, I would like to stress that this is not just on paper. We visited all the municipalities and met with the local people. Mr. Nikitin [Acting Governor] personally asked what businesses and residents need, which growth points are possible, what people want to do and which competences are required, and what is lacking in terms of education quality and healthcare accessibility. Therefore, this document and its main points have the backing of the local people. Businesses are willing to invest in this infrastructure and the governor, of course, is applying his efforts to attracting federal resources and development institution resources. We are basically working with all the regions under this philosophy. We have just started cooperating with Karelia. We discussed the measures to act on the priorities set out by the local businesses and residents with Mr. Parfyonchikov. A few words about the WorldSkills movement, which also has your support. A competition among adult skilled workers was held recently, as well as in the junior category among school students. Moscow, Tatarstan and Krasnodar Territory left all the other teams behind, collecting all the gold medals. The decisions and steps taken by the regional heads are essential in terms of training skilled professionals and motivating them. For instance, the Head of Tatarstan, Mr Minnikhanov, issued instructions to bring the vocational training system in line with WorldSkills international standards. The Agency of Strategic Initiatives is currently carrying out a pilot project with Tatarstan to introduce standards to train industrial workers. We are working with secondary schools, universities and vocational training colleges, as well as with employers to this end. This includes a dual education approach, specifically, in terms of training strategies, setting priorities and selecting the competences that Tatarstan seeks to promote. It is important that Mr. Minnikhanov has already ordered these competences to fall in line with WorldSkills standards, but he has also looked beyond them into the future by focusing on IT and the digital economy, i.e., the skills that will be increasingly relevant in one or two years. Moscow allocated grants to the winners of professional competitions, and will do so every year moving forward, which of course is a serious incentive for young professionals and for reshaping the whole system in general. Employers clearly appreciate this and are willing to contribute to these efforts. Regarding social practices, some charity foundations had questions about the project to provide parents with access to children’s intensive care units. There are pilot regions that are testing this approach. Of course, this should not be about imposing decisions from the top, since the opinion of doctors also matters. We have to start showing how it works in the hospitals. We have showed the Deputy Healthcare Minister how Mr. Morozov [Ulyanovsk Region Governor] redesigned a city hospital to allow parents to be near their children when they are in intensive care so both the child and parents feel comfortable, and if need, parents can give a helping hand. Doctors view parents as helpers: the parents do not get in the way. On the contrary, they help look after their child. Kaliningrad Region. As concerns the filmmaking industry, we are carrying out a project with the Film Producers’ Association to attract investment to this industry, from both international and Russian companies. Our colleagues at the regional level, for example, the Ulyanovsk Region, are testing the subsidy system. Ulyanovsk has started several projects as has Anton Alikhanov [Acting Governor of the Kaliningrad Region] and we hope it will help promote our regions. Russians and foreign countries will learn more about the beautiful places in our country. As concerns the skills required for the future, this is undoubtedly our priority. We are working on several projects for schools and additional education. Dmitry Peskov [Director of Young Professionals, Agency for Strategic Initiatives] will speak in more detail about his nationwide initiatives for developing competences for the future in technology and the digital economy. But I would like to point out several projects – for instance, the kvantoriums which we presented to you and some of which you personally opened. They are already operating in 30 regions and 60,000 children have had access to them. The kvantoriums are already being franchised by other additional education systems. As far as I know, this year more children’s techno parks will open in 17 regions. We are organizing technology competitions within this nationwide initiative and some 100 children have already become winners. We were Sberbank’s partners in another project, the School of 21st Century Skills, in cooperation with the Higher School of Economics. We collected applications from leaders of the projects for innovative solutions in developing innovative skills in our children, from across the country. The best projects received support from the agency. We are also replicating those solutions in other regions. We want to enlarge the scale of this competition next year. We organized a federal-level session at Artek this year. Along with the young people, we addressed social projects. Young people aged 14−16 discussed how to convert any idea that addresses a social issue or task into a project to accomplish the goal. The children suggested some very interesting projects during the two weeks. Together with experts, Sberbank, charity foundations, managers and private startup accelerators we held training sessions and worked with teams. Mr President, there are 17 amazing projects; I told Mr. Belousov [Presidential Aide] about several of them today. These projects are now basically ready to be implemented. Indeed, the Economic Development Ministry and the Sberbank foundation have already given the go-ahead to support, finance and implement them. I would like to mention an example, only a couple of projects, including the Courtyard Olympics. Young people tend to spend so much time with their electronic devices that they don’t mix with their peers outside school, so, some of them suggested holding courtyard Olympics with gyro-scooters, skateboards and bicycles; and I can’t even list all the kinds of equipment being used by our boys and girls in courtyards. This is a very good idea. I believe we need to revive this neighborhood get-together culture, so that the children can compete, develop physical skills and the art of communicating with their neighbors. The students also proposed a Children Teach Children app. This app allows children who can assemble a robot, for example, to teach younger or less experienced children how to do it, and maybe the younger children will do an even better job. Regarding cost-effective management, this concept is, of course, highly popular in the social sphere, and we are also working with the regional leaders here. Per your instructions, we have already appointed officials to oversee the implementation of regional road maps that will help private business access the social sphere. Maybe people are already tired of our project management offices, but they are already operating in the regions. Regarding the investment climate, we want to establish the same cost-effective project management offices in the social sphere. Our colleagues are already inviting representatives from NGOs, volunteer organizations and charity foundations for joint discussions on how to remove various barriers and implement peoples’ initiatives in each region. You gave us instructions to work out a national volunteer movement development plan. We have prepared this with the Civic Chamber and the Ministry of Economic Development. The Government has approved it, and now it is time to use it, the most important thing. The plan has the backing of the volunteer community because more than 300 regional organizations contributed to the preparation. Certainly, it is necessary to work locally in the regions because volunteers and charity funds did raise many issues at the meeting today. Mr. President, you said that this was the responsibility of the regional authorities. Therefore, today we are proposing a standard for interaction between regional officials and local volunteers, for the approval of the supervisory council. This document is not too complicated and only contains nine steps that every region can comply with in order to respond to the community’s needs. So what are these steps? The first point is the procedure for cooperation between the regional officials and volunteers. It includes clear and specific guidelines and requirements for volunteers to meet. As you remember, we discussed the relation between volunteers and directors of hospitals or schools who are personally responsible for the safety and security of their institutions. Therefore, volunteers must meet certain criteria and possibly operate through an NGO to disburden the management if these institutions of security risk. These criteria and requirements must be included in the guidelines. Some regions have already adopted the documents, and we are also using them as examples of best practices that can offer recommendations on drafting and implementing these rules. The second point is who should be responsible at the regional level. It could be a deputy governor for whom volunteering and development of the non-government sector is not a leftover duty but a priority task for which he or she will report to the governor. The third point is, certainly, infrastructure. This includes resource centers and centers for volunteer development, platforms that can arrange training and offer best volunteer practices for the region, as well as partner programs implemented side by side with large corporations and charity foundations. Additionally, they can be responsible for profiling a social sector volunteer. Information support is essential, as a number of speakers have already mentioned. We are prepared to offer the regions to hook up to the Volunteer of the Russian Federation portal, so that anyone can use it to contribute to both regional and federal volunteer and social assistance programs. This could also be seen as an incentive, although no money is involved, since it is more about recognition and gratitude, and support for volunteers. Many regions already offer awards and other types of recognition, for example, a volunteer pin or certificate. This is important to those people. This is something they are willing to fight for, in a positive sense, something that supports them spiritually, an indication that they are doing the right thing that matters to others. This is why we want other involved regions to offer awards like this. Mr. President, creating some kind of presidential volunteer pin would be an important incentive and a source of inspiration for volunteers. I think our children and all of us would be eager to get this award. Positive feedback is essential, since the project office cannot operate without feedback from people working in this area. Governors are not always able to check whether the standard is properly working and is consistent with the needs of the volunteers. It is important to have a focal point, a coordinating center or council within the regional administration, like the investment councils that review projects at the regional government level. The same approach could be used for volunteers and non-governmental organizations by creating a platform for sharing their perspectives on what works and what does not, providing feedback and proposing new projects. Basically, this is a set of requirements based on real-life examples from a number of participating regions. All we need to do is expand the framework. Sometimes adding a single item from the standard program is enough, sometimes two need to be added since we want all nine elements of the standard to be implemented. As of today, 37 regions have said that they were ready to implement the standard. Consequently, if the Supervisory Board supports the initiative, we will start implementing the standard. I think the first results will be visible as early as this year, since the standard is intended for facilitating access and expanding the possibilities for participating volunteers. Of course, it is essential to enable projects like this to grow. I serve as an expert in the foundation in charge of allocating presidential grants. The foundation provides substantial support to regional non-profit organizations, which submit wonderful projects. We recently held an expert board meeting to review applications. Applicants need advice and assistance when it comes to submitting applications on how to describe a project, assess deliverables and resources. This is one reason this is a very popular framework, and all the regions need to create similar infrastructure by establishing resource centers, social innovation centers, just as the Economic Development Ministry did in a number of regions (with our input). This initiative is currently financed through grants only. However, we would very much like social entrepreneurs to contribute as well. This can be done, since many projects have already been implemented under this model. These are projects that have a real social purpose, such as helping vulnerable social groups. They can also be profitable. But actually, it is not uncommon that project leaders lack the knowledge or experience they need for developing a business model, bringing in the partners, investors and stakeholders they need. Therefore, the acceleration and growth facilitation programs are very popular. A few words about financial support mechanisms. We need mechanisms guaranteeing reimbursement without being bank loans. People behind these projects do not work with traditional banks or even the Russian Bank for Small and Medium Enterprises Support; they have nothing to pledge as collateral or even any working capital. They cannot prove their sustainability or provide security, so the banks are not interested. In fact, lending institutions do not know how to evaluate projects like this, so they are not interested. But we see a great future for these projects, judging by international and Russian experience. Thank you very much for supporting my proposal on the creation of this mechanism. We have met a number of experts, including prominent entrepreneurs, business people, those currently involved in corporate social responsibility and other social responsibility projects, those who have some experience in assessing projects of this kind. Everyone is saying that this is a very relevant initiative, so we decided that it would be advisable to begin with even small contributions. The fund can operate even on non-budgetary funding. Such social entrepreneurs focus on small projects in the social sphere. The amount of required investment averages 2.5 million, the loan term they are looking for is anywhere from one to three years. They are quite capable of paying such loans back. However, this additional acceleration program removes the risk of the borrowers defaulting on these loans. Working on this project, we can see that it has been brought to the level of financial stability, and can pay for itself. As a follow-up, we will not only fund it, but we will also have a mentor who will help the project leader properly structure and implement it. These projects are in demand. Today, Viktor Vekselberg confirmed his interest in it and is willing to participate in establishing and financing such a fund, and also agreed to join the board of trustees. Sergei Solonin, Qiwi Financial Group, also confirmed his interest and said he would participate in the fund's activities. Sergei Gorkov is also willing to join the board of trustees. We have already worked through even the acceleration programs and VEB’s competencies as they apply to project evaluation. The relevant departments, such as the Ministry of Economic Development, the Ministry of Labor, and the Ministry of Healthcare, are ready to join the board as supervisory bodies to evaluate projects and provide their expert analysis for compliance with those socially important tasks that we need to resolve today. We already have people who are willing to form the core team. This project is particularly important for Sakhalin Region and other Far Eastern regions (the Governor of Sakhalin also agreed to participate), because social entrepreneurship can be a point of growth in local small towns and remote locations. The implementation of such small projects will ensure stability, financial viability, and the well-being of the people residing in these areas. Therefore, Mr. President, if you agree to support us, we are ready to get this fund going. Of course, we want this project to pay its way, to make this model sustainable. According to our financial model, the project will recoup in three years. Importantly, this model will be replicable as a franchise so that other regions can use it. Any company can create a venture fund to provide funding to social startup companies. This will be a serious nationwide mechanism, a tool to support social entrepreneurs like Work for Mom, Surdo-Online, or Uchi.ru to grow and expand. Mr. President, if you agree to support us, we will be able to get started in September. Thank you. We will look into it in more detail. As we mentioned at a meeting with nonprofit organizations and volunteers, we will certainly keep moving in this direction. I hope that we will see this project to completion. 0 Comment to "Meeting of the Agency of Strategic Initiatives Supervisory Board."